The Easter Bunny has left a series of 12 fun clues for your child to follow on Easter morning for an extra-adventurous easter egg hunt! 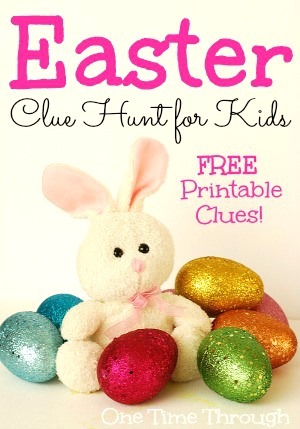 This hunt will take your child around the house, through a traditional egg hunt, and then outside if you want. Totally modifiable, printable and did I mention…completely FREE! Check it out! 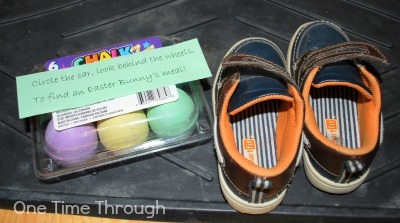 I created this fun Easter hunt activity last year for an extra special Easter morning surprise for my son Onetime (now 3 1/2 years old.) Let me tell you about our hunt first, then I’ll show you how you can do your own! It all began with a special personalized note from the Easter Bunny that he found on the breakfast table next to a stuffed bunny. Onetime was SO excited to get a note from the Easter Bunny! I have come and hidden clues all over your home! Your job is to go from clue to clue, and find the surprise at the end for you! And we were off on our hunt. 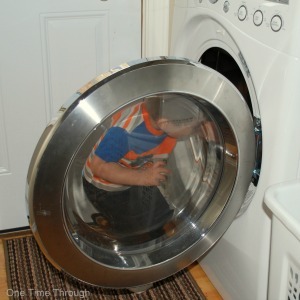 The first few clues led him around the house into his bedroom, closets, and even into the washing machine! At each new spot, Onetime found a little treat like a chocolate or playdough egg, and a little favour basket (see bottom left of picture below) with a new clue from the Easter Bunny inside. 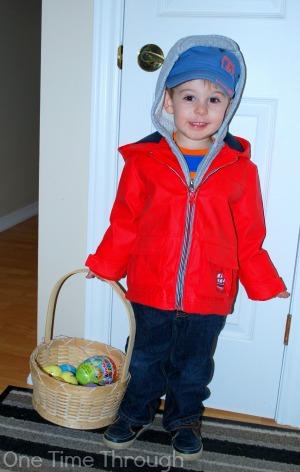 The first part of the hunt took him around the house, and then to the living room for a traditional chocolate egg hunt. 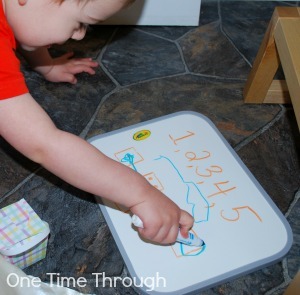 At one of the spots, we put some new markers and a white board and I created a little math numeral and dice pattern matching activity for him to do before moving on to the next clue. The final indoor clue was a box of easter egg chalks with a clue that led Onetime outside for even more adventures. The outside part of the hunt took him to a few places around the house (the car, the porch, the birdbath), then for a general egg hunt in the backyard, and finished by digging up a surprise in the sandbox (a kite!). At the end of the hunt, along with the final buried surprise, Onetime also found a last note from the Easter Bunny wishing him and the family a wonderful Easter! How Can You Do YOUR Hunt? I’ve made a copy of the clues and notes that I used for our hunt that you can print off and use for your kids. If you have Word – you can download that copy and add your child/children’s names into the notes to personalize them. If not, print off the generic PDF clues. See the bottom of the post to download them. Decide which ones you want to use. If you want to do only an indoor hunt, only use clues 1 to 6 and the final Easter Bunny letter. Note: The outdoor hunt uses clues 7 to 12. You can eliminate any of the clues you don’t want to use. Once you’ve decided which clues to use, cut them apart and number them in order. 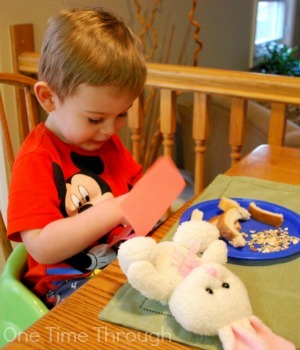 Place the first letter from the Easter Bunny in an envelope somewhere your child/children will find on Easter morning. Also include the beginning clue. Hide the next numbered clue in the next spot, and continue from spot to spot until all the clues are hidden in order. Hide some eggs in the living room and around the yard if you’re doing an outdoor hunt. If you’re only doing the indoor part of the hunt, place the final note with a large Easter Egg in your washing machine/dryer. 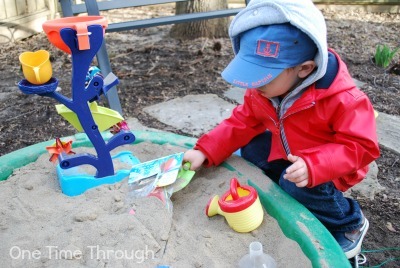 If you’re also doing the outdoor part, bury the final surprise along with the final Easter Bunny letter in the sandbox or garden. That’s it! I really hope you and your kids enjoy this hunt as much as my son did! 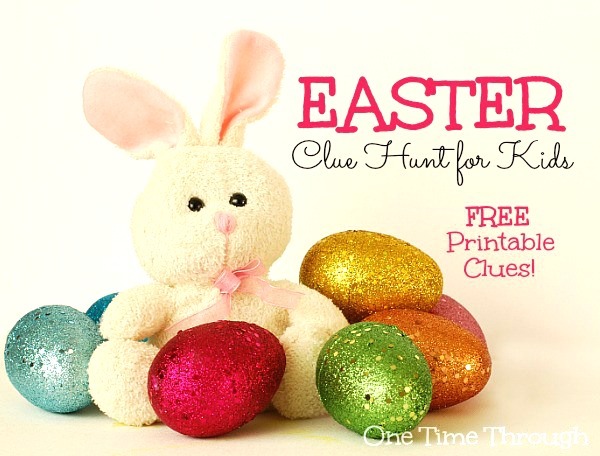 To get your copy of the Easter Bunny Clue Hunt printables – all you have to do is click on one of the links below! Thanks for hopping by today! Have a wonderful Easter! I love this! I am going to do it for my littles this Easter! Thanks for doing this! Thanks Melissa! Hope you had fun with it! I hope you enjoy this activity Liz! We had lots of fun with it last year! Happy Easter!